More than 60 benefits and maximum mobility from 1 May to 31 October 2018! From 1 May 2018 with the ‘Nationalpark Sommercard’ there will be an inclusive ticket for a holiday in the Hohe Tauern National Park holiday region. 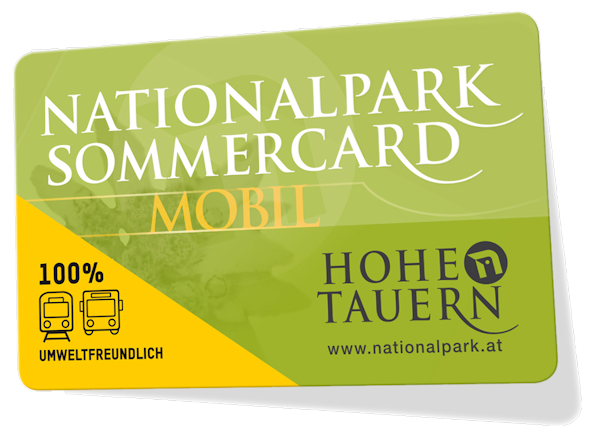 The ‘Nationalpark Sommercard ’ also ensures you enjoy maximum mobility, since you get to use local public transport free of charge. The day ticket for the ‘Großglockner alpine road’ and the weekly ticket for the Gerlos Alpenstraße are also included.